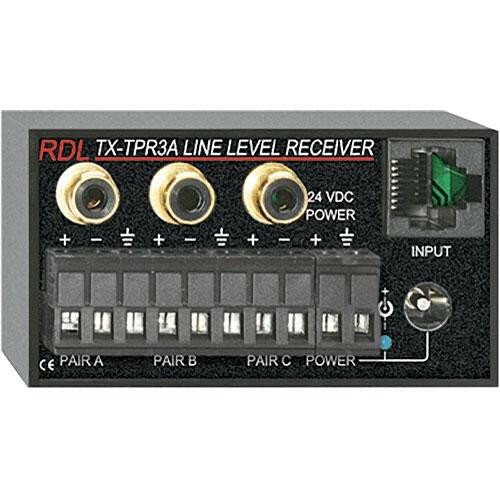 The TX-TPR3A from RDL is a three-pair receiver module compatible with RDL Format-A twisted pair products. Each twisted pair input has (3) -10dBV unbalanced outputs and +4 dBu balanced outputs. This module has a bridgeable input, which allows for connection of up to 10 receiver outputs for each cable pair for even more flexibility in routing and installation when utilizing Format-A products. The TX-TPR3A can receive power via terminal block or power bus jack with and send power to other modules via the RJ45 jack. Box Dimensions (LxWxH) 4.1 x 2.1 x 1.4"